360 by Rescue Beauty Lounge. 2 coats w/ flash. According to Ji Baek of Rescue Beauty Lounge: 360′ is a move where the surfer and board spin around on the face of a wave. It also is a gorgeous deep-water aqua blue polish. According to me, 360′ is the perfect conceptualization of the warm, aqua blue waters around the islands of Fiji in the South Pacific that I have always wanted to visit since I was a small kid cursing the cold northeastern winters. It is aqua perfection in a bottle. 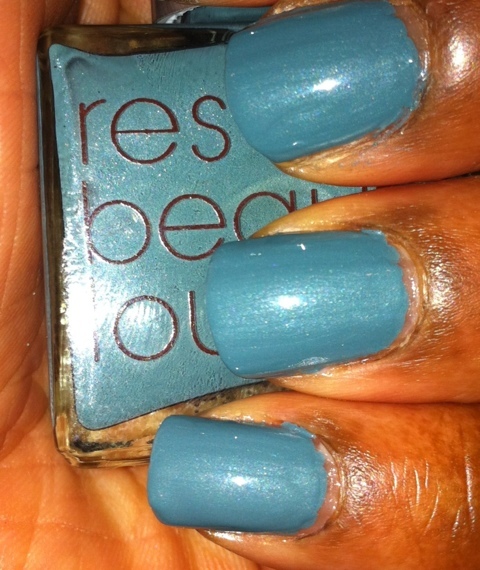 Rescue Beauty Lounge (RBL) 360′ is a beautiful mid-tone aqua blue nail polish with white shimmers in it. The shimmer is very sophisticated. It’s not ostentatious at all and adds to the richness of this very unique nail polish. I can see this color working for all skintones including cool and warm but honestly the biggest impact from this color will be felt as if you have very cool undertones. As a woman of color, my biggest gripe with mid to light nail polishes is the color can look ‘chalky’ next to dark skin. I’m happy to say this hasn’t been the case with this color. It is opaque in one coat but you can’t go wrong with two, perhaps even three. Application is smooth with minimal to no streakiness of the color when applying. Makes me want to take a trip to Jean-Michel Cousteau's resort in Fiji. When it comes to wear, RBL polishes are long-wearing and this color is no exception. As a software geek who types 120 words per minute on the regular I’ll usually get very minimal tip wear. The polish does resist chipping longer when used in conjunction with the RBL Treatment System (scheduled to be available for pre-order as a set in early Jan) but I’ve used it with MAC Overlacquer top coat with the same result. Side note: do not, under any circumstances use Seche Vite quick dry top coat with RBL polishes. Saying it will be trashed is an understatement. You have been warned. Catch the wave that is Rescue Beauty Lounge (RBL) 360!